John F. Kennedy's youthful looks, cheerful family and charming demeanor captured the American imagination like few Presidents had ever done. Here, Kennedy poses with his wife Jacqueline and their two children John and Caroline. Like King Arthur and Guinevere, a dynamic young leader and his beautiful bride led the nation. The White House was their home, America their kingdom. They were John F. and Jacqueline Kennedy. After squeaking by Richard Nixon in the election of 1960, John F. Kennedy set forth new challenges for the United States. In his inauguration speech, he challenged his fellow Americans to "Ask not what your country can do for you — ask what you can do for your country." Earth's place in the universe was seen from a dramatic new perspective when American astronauts reached the Moon in the late 1960s. 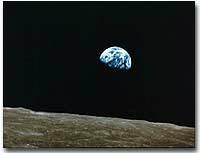 While the first landing on the Moon's surface would not take place until 1969, this photograph of an "earthrise" was taken during the 1968 Apollo 8 data collection mission. Proclaiming that the "torch has been passed to a new generation of Americans," Kennedy, young and good-looking, boldly and proudly assumed office with a bravado. Many Americans responded to his call by joining the newly formed Peace Corps or volunteering in America to work toward social justice. The nation was united, positive, and forward-looking. No frontier was too distant. The newest frontier was space. In 1957, the Soviet Union shocked Americans by launching Sputnik, the first satellite to be placed in orbit. Congress responded by creating the National Aeronautics and Space Administration (NASA) under President Eisenhower. When Kennedy took office, the United Space fell farther behind. The Soviets had already placed a dog in space ("mutnik," to the press), and in Kennedy's first year, Soviet cosmonaut Yuri Gagarin became the first human being to orbit the earth. John F. Kennedy backed the civil rights movement and supported James Meredith's enrollment in the University of Mississippi. Fear that violent opposition to his attendance could erupt at any moment led to Meredith's having to be escorted to class by U.S. marshals. Kennedy challenged the American people and government to put a man on the moon by the end of the decade. 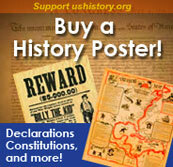 Congress responded enthusiastically by appropriating billions of dollars for the effort. During Kennedy's administration Alan Shepherd became the first American to enter space, and John Glenn became the first American to orbit the earth. In 1969, many thought of President Kennedy's challenge when Neil Armstrong became the first human being to set foot on the moon. Domestically, Kennedy continued in the tradition of liberal Democrats Roosevelt and Truman to some extent. He signed legislation raising the minimum wage and increasing Social Security benefits. He raised money for research into mental illness and allocated funds to develop impoverished rural areas. 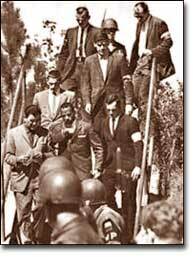 He showed approval for the civil rights movement by supporting James Meredith's attempt to enroll at the University of Mississippi and by ordering his Attorney General, brother Robert Kennedy, to protect the freedom riders in the South. 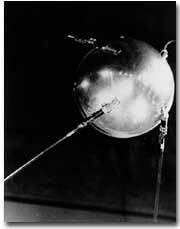 Weighing in at just 184 pounds, Sputnik was the world's first man-made satellite. Its launch by Russia in 1957 resulted in the almost immediate formation of the National Aeronautics and Space Administration (NASA) in the United States. The "space race" was on. However, most of Kennedy's more revolutionary proposals languished in the conservative Congress. He wished to protect millions of acres of wilderness lands from developments, but the Congress refused. His efforts to provide federal funds to elementary and secondary schools were denied. His Medicare plan to provide health insurance for the nation's elderly failed to achieve the necessary support. Congress was dominated by a coalition of Republicans and conservative Southern Democrats who refused to expand the New Deal any further. In his abbreviated Presidency, Kennedy failed to accomplish all he wanted domestically. But the ideas and proposals he supported survived his assassination. Medicare, federal support for education, and wilderness protection all became part of Lyndon Johnson's Great Society. Lee Harvey Oswald assassinated Kennedy in November, 1963. His death provided a popular mandate for these important programs. In the tumultuous years that followed, many yearned for the happy Kennedy years — a return to Camelot. The official Peace Corps site describes the mission of this volunteer organization that is the enduring legacy of President John F. Kennedy and over 155,000 Americans who have served as Peace Corps volunteers around the world. Ready to join? This site is ready to sign you up. Origins of the Peace Corps and a summary of its evolution over four decades.